A while ago I met a lovely couple of guys who had just set up their own mini company. Turns out they had all met at various graduate recruitment events and decided to buck the trend of working in the City and set up on their own. SmallcarBigcity came about from their mutual love of classic mini Coopers and they can now been seen touring round London showing off the sites of our great capital city. 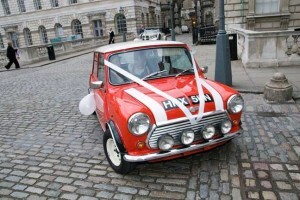 The minis, complete with their very smartly dressed drivers are also available for hire for weddings. I don’t think that these would work for the type of dresses that were featured on Big Fat Gypsy Wedding last night but for those brides with more modest dresses, what better way to arrive at your wedding than in a quintessentially British car. 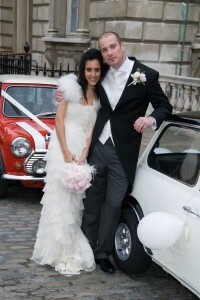 Take a look at these great wedding pics from a wedding the company did at Somerset House. Not sure they are my preferred mode of transport for anything wedding cake related but I’d certainly love to rock up to my own wedding in one of these!